You are hereby invited to the next Extended NCCC Stakeholder dialogue scheduled for 6-7 November 2018. 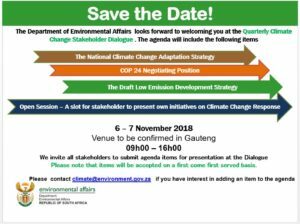 We invite you to kindly submit your agenda items for the dialogue on and to RSVP climate@environment.gov.za on or before Monday 29 October 2018. The agenda and further details will be communicated to confirmed participants. This message and any attachments transmitted with it are intended solely for the addressee(s) and may be legally privileged and/or confidential. If you have received this message in error please destroy it and notify the sender. Any unauthorized usage, disclosure, alteration or dissemination is prohibited. The Department of Environmental Affairs accepts no responsibility for any loss whether it be direct, indirect or consequential, arising from information made available and actions resulting there from. The views and opinions expressed in this e-mail message may not necessarily be those of Management.